SecureVideo - How do I access my Business Associate Agreement (BAA) with SecureVideo? 1. 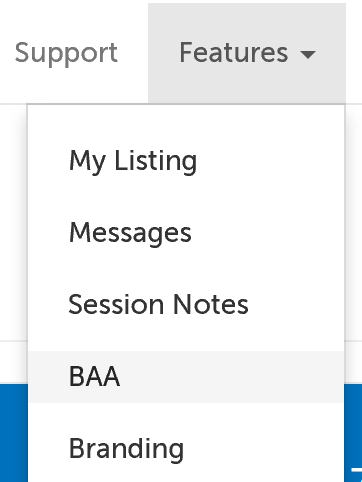 Click on the "Features" tab and select "BAA" from the drop-down menu. 2. Use the "Request Signed BAA" button at the bottom, left-hand corner of this page. 3. It may take a minute to generate your BAA, but once that has finished, you will see a button "View BAA". This will open a PDF document in your browser. Please print it out, fill in and sign pages 5 and 6, and then fax the entire 6 (six) pages to SecureVideo at (510) 337-8833. You can also scan and e-mail the document to [email protected]. This article was last reviewed by our Support team on April 30, 2017.